Valeria is a +28 year Sales. Marketing and Leadership veteran, recognized for her exceptional ability to speak with clarity, conviction, insight and dynamism on a full spectrum of topics about achieving success in the global marketplace. Valeria is an internationally renowned trainer, coach and public speaker for more than 20 years. Valeria draws upon applied and successful business know-how that has secured her ‘Top Producer’ status in every industry she has endeavored. 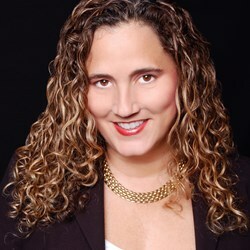 Infused into her messages are her personal life experiences from years of marketing consulting to major national and international organizations including international real estate brokerages, the American Chamber of Commerce, Procter & Gamble, Avon, DHL, General Motors, Compaq, and other industry leaders. Valeria has being training and coaching specializing in Leadership and International sales and marketing strategies to more than 4,000 sales agents, manager and companies owners from more than 40 nationalities in the last 15 years. She has been a keynote speaker and lead presenter in numerous international conferences in the US, Central America, South America and Europe. Valeria is the Lead Instructor and coach of the “International Marketing Bootcamp”, She is a Certified International Property Specialist (CIPS) instructor for The National Association of Realtors (NAR) and a TRC (Transnational Referral Certification) instructor for ICREA. In 2008 she wrote her first book, Success with International Customers, book that she wrote after her long experience on working with international customers. Helping leaders and sales agents to thrive in International market is one of her most important missions in her career. Born in Argentina, raised and educated in Venezuela where she earned a degree in marketing and advertising, Valeria now resides in Miami, South Florida. She is fully bi-lingual in both English and Spanish, delivering compelling speeches and seminars in either language to international audiences. She is a Certified Speaker, Trainer and Coach for the John Maxwell team and Faculty for The John Maxwell Team, certified DISC Trainer and Certified DISC Consultant, a graduate of the Speakers Academy, a NLP practitioner, an expert in leadership, international sales and communication. Her understanding of human nature, targeted messages, astute insights, and vast experience in the Latin American market have made her one of today’s most sought-after international trainers and speakers.